Before kids came along, we were living in an 850-square-foot condo in downtown Toronto. That included my home office. We were not crowded there. Yet here we are, in a 3,000 square foot house, and it seems that "stuff" collects everywhere. It feels more crowded. 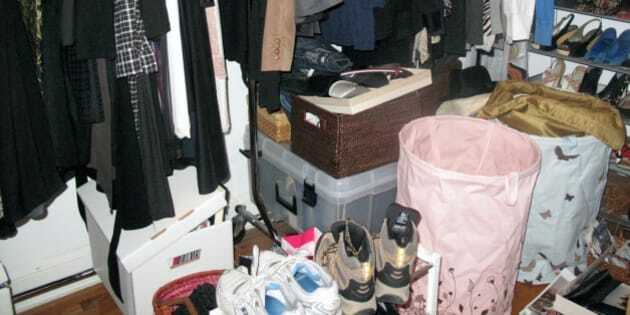 A cluttered closet full of clothes, shoes,accessories. My daughter is finally getting her own room. And she's doing it through osmosis. We bought this century home in part for its huge attic. What a playroom! In fact, the attic was used as a playroom, but much less so than we had envisaged. 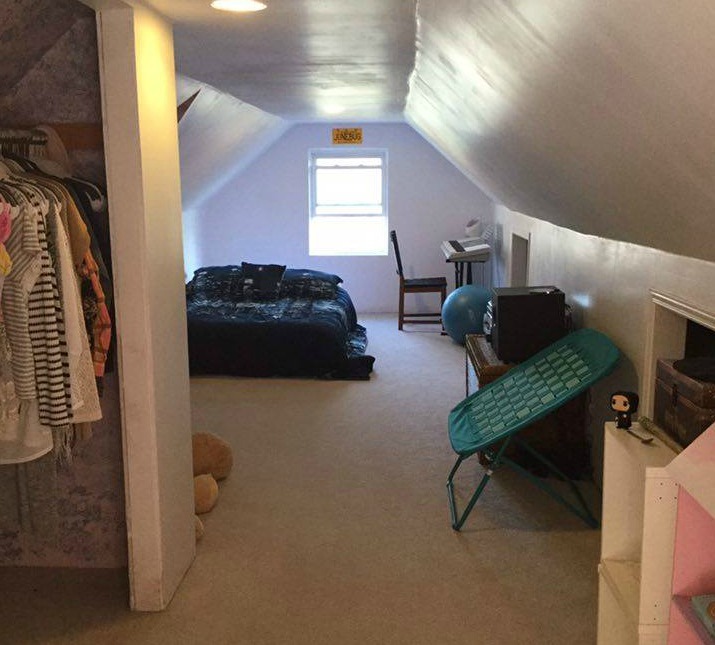 At 14, our older daughter decided it was time for a room of her own. She had been hoping for one at 12, and our promises of "when we get around to it" were getting stale. So she pulled out a spare mattress and camped on the floor of the first room of the attic, the landing at the top of the stairs. She would sleep in the company of all the assembled childhood toys that we had yet to deal with. If we had lived in an apartment, we would never have accumulated so much stuff in the first place. We couldn't have -- there would just not have been the room. But a three-storey house seems like a magnet for anything that might fall under the heading of "stuff." And with two kids in various activities, a home business and a long commute to the city for one of us, getting rid of the stuff was always something best done at a later date. Despite this house cleaning, we still retained many more toys than two children can play with. If Canadian children are at all like British children, they play with only five percent of their toys. But it's not just the toys that we collected. To protect our toddlers from wandering head-first down stairs, we had installed battery-operated gates. The gates were long gone, but the posts were still attached to the door frame. And most of the electrical outlets in the attic were still blocked by those plastic outlet plugs, fending off our 14-year-old from the dangers of being a toddler. I always hated those little plastic plugs. They were so hard to pry out each time we needed to use the vacuum cleaner. Back then, we didn't have the new childproof outlets that I just found out are now available. These don't require any action to access. Just push a plug in straight, and it goes in. Try to stick a pencil or a spoon into one hole in the outlet, and it won't go in. With the gate posts and outlet plugs gone, we could paint. And with the paint barely dry, my daughter began moving her stuff into the main attic room. Out with the old stuff. In with the new stuff. Only her clothes remained. That's because the closet was still full of... stuff! In an apartment, you would not end up collecting all this stuff. I am pleased to say that as of a couple weeks ago, the costumes have been sorted into bins, some of which the girls plan to store for posterity, some of which we are giving away and some of which were so ratty that we had to argue with the garbage man to take them. What is taking shape is a dream loft any teenager would go gaga over. So we are reinventing the playroom for toddlers as a loft for a teen. And with one teen out of the joint bedroom, the upcoming teen will now get her own room, all to herself. But first, there's a lot of "stuff" to clear out of that room, too. Before kids came along, we were living in an 850-square-foot condo in downtown Toronto. That included my home office. We were not crowded there. Yet here we are, in a 3,000 square foot house, and it seems that "stuff" collects everywhere. It feels more crowded. It's like we acquire things just because we can. And we store things just because we can't seem to get rid of them. We live in a warehouse. Which brings me back to my theory that the bigger the home, the more clutter you collect. Is my theory correct? What do you think? What has been your experience? If we all lived in smaller homes would we become more experiential and less materialistic?